5% Off For New Customers! Over time, all buildings will require repairs. Some effects of age on your home or business, such as sloping floors, might be merely annoying, but others can be dangerous. Aging electricals fall into the latter category, as studies have shown that faulty wiring or other components account for up to 50,000 fires each year. In order to keep you, your property, and your family or employees safe, it’s important to keep your wiring up to date. In this article, our team at Lamm Electric has put together a list of signs that indicate that you might need electrical rewiring. Burning Smell- One of the most noticeable indicators that you might need electrical rewiring is a persistent burning smell. If you notice such an odor — one that doesn’t come from a specific source and does not fade — turn your power off at the circuit and call an electrician immediately. Discolored Outlets and Switches- Another sign that you might have faulty wiring is discoloration on your electrical outlets or light switches. Loose connections behind these fixtures can cause stray sparks, creating small fires that can char and discolor the outlet or switch plates. If you notice this kind of discoloration, don’t ignore it, as leaving it unaddressed could have potentially life-threatening consequences. Instead, call our team at Lamm Electric to come have a look. 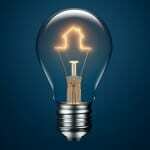 Flickering Lights- Sometimes, flickering lights are the result of a bulb not being screwed in properly, or that the bulb is just reaching the end of its life. However, if this flickering is not confined to a single fixture but is spread out over a whole room, section, or even the whole building, the fault is probably with the wiring. Call us at Lamm Electric to get an assessment on whether you need electrical rewiring. When you need electrical work done in Charlotte, North Carolina, put the project into the hands of licensed electrician you can trust by calling us at Lamm Electric. As strong believers in 100% customer satisfaction, we’ll do whatever it takes to get the project done efficiently and affordably. Let our licensed electricians handle your electrical remodel and wiring. Contact us today! 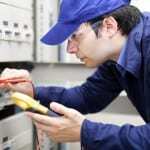 We are a company you can trust with your business’ electrical project needs. When You Need Electrical Services, Use Our 5% Off Coupon For Your First Job! Charlotte and surrounding areas; Indian Trail, Matthews, Belmont, Huntersville, Mt. Holly, Ballantyne & Mint Hill, NC. We are available 24 hours a day for all emergency electrical services in and around Charlotte!